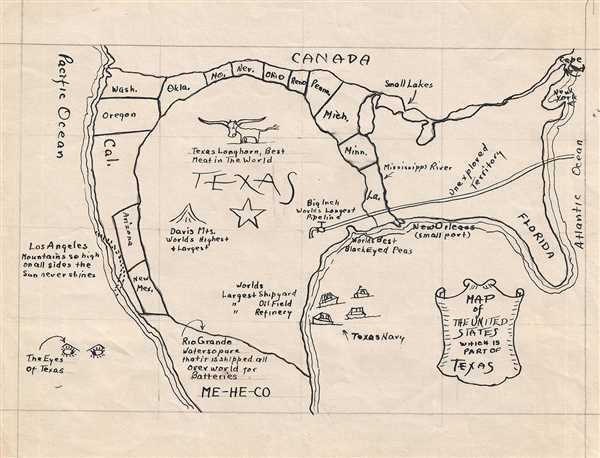 This manuscript map of the United States circa 1943 depicts the creator's vision that the United States is, in fact, part of Texas. Based on the presence of the Big Inch pipeline, which was being constructed between 1942 and 1944 and was clearly very much on the mind of Texans, we can deduce that this map dates to this period, or shortly after. This manuscript map is in the style of Daniel Wallingford, who pioneered the creation of maps from a social perspective with a comic slant. In this map, a disproportionately large Texas dominates the continental United States and includes such sights as the World's Largest Shipyard, Oil Field, and Refinery, as well as a pipeline that stretches to the Atlantic Ocean. Texas also possesses its own navy. The other states are relegated to space at the periphery, with Washington, Oregon, and California appearing in the correct geographic location, while states such as Oklahoma, Missouri, Nevada, Ohio, and the new state of Reno, have been relocated to the Canadian border. The United States east of the Mississippi is declared to be Unexplored Territory, although Florida, New York and Cape Cod merit labels. Canada and Mexico are also labeled, although Mexico is known as ME-HE-CO. The map is undated and unsigned, nor have we found any published examples that resemble this map. Based on the presence of the Big Inch pipeline, which was being constructed between 1942 and 1944 and was clearly very much on the mind of Texans, we can deduce that this map dates to this period, or shortly after.